ROSIE LEE IMPORTS HAS FOOD FROM THE U.K. AND SOUTH AFRICA, includes TEA, CHEESE, MEAT PIES, CANDY, COOKIES, SAUSAGES, JAMS, ETC. SOUTH AFRICAN RUSKS, BILTONG, BOEREWORS. AND!!! 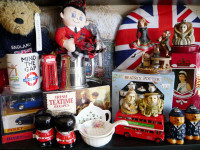 GIFTS FROM THE U.K.: TEAPOTS, CUPS, MUGS, DR. WHO, BEATLES, UNION JACK INSPIRED GIFTS ETC.